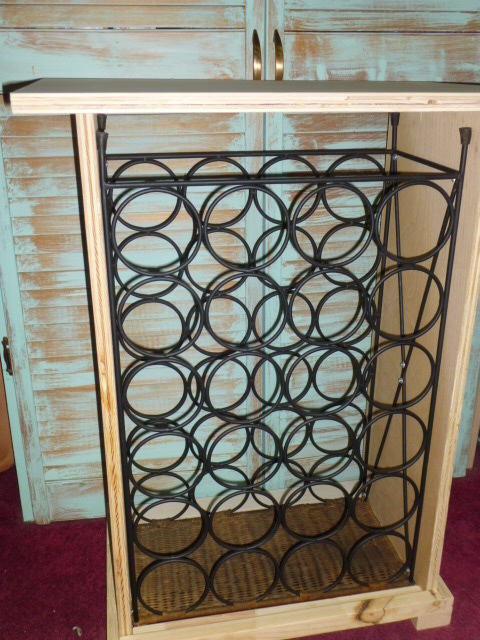 Michael wanted to make a nice wine rack for my Megan (son Elliot’s girlfriend) for her birthday. He had made a couple of BIG, custom ones for someone before. The kind where he cut out half circles in the wood for the wine bottle to fit in. They were a LOT of work. And I didn’t really ‘like’ the end result. Completely functional and sturdy and all, just not very ‘pretty’. 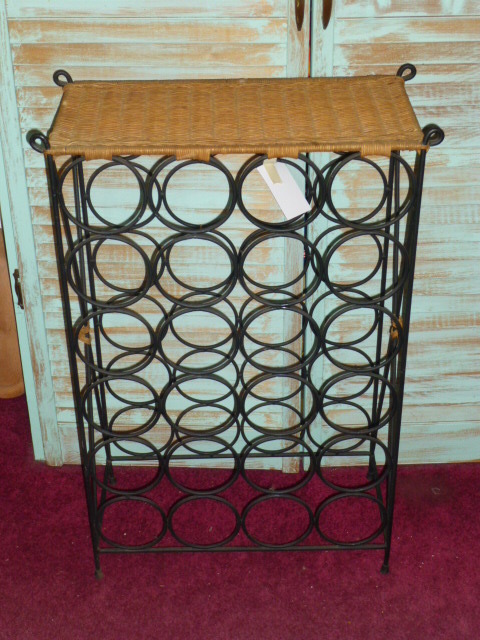 So, while I was out thrifting a few weeks ago, I picked up this wrought iron and wicker wine rack VERY inexpensively. 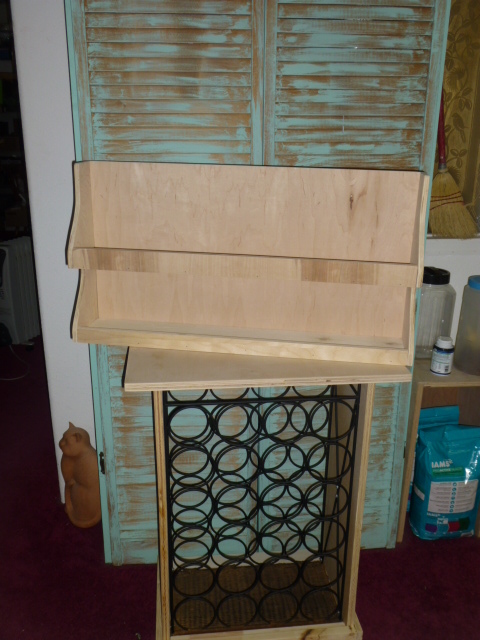 Thinking that Michael could use just the bottle holder part, then build a nice cabinet to hold it. It sat in our living room for a week or so, and I was noticing how it didn’t ‘sit’ very sturdily on those tiny legs. And it is was a bit unsteady EMPTY, what was it going to be like FULL of wine bottles?!? So, I flipped it upside down, and voila! Nice and sturdy. So that is what Michael did when he built the casing for it; set it upside down. And here’s what we ended up with. Using all recaimed birch plywood. Not bad, eh? And it sits VERY straight and sturdy. We don’t know Megan well enough to have selected a color for her. 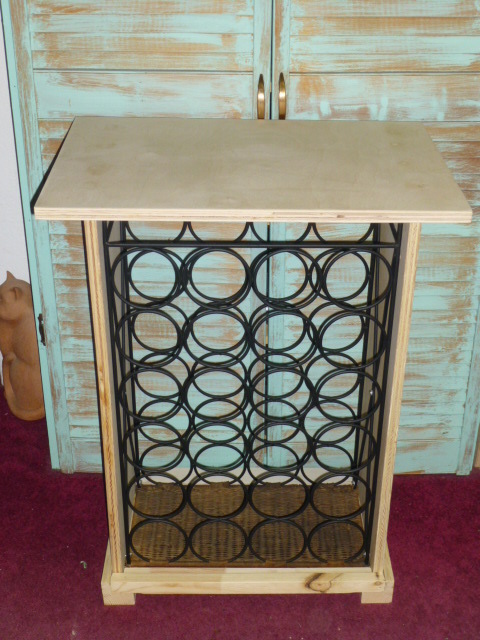 And Elliot had recently built her a couple of bar stools for the overly high counter in her apartment; so we figured she’d be doing some painting soon anyhow, and left the wine rack unfinished. There’s the wicker ‘top’, at the bottom. 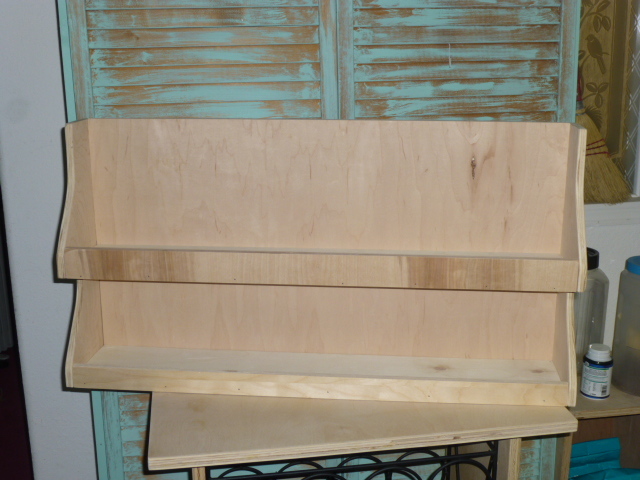 And we wanted to give it a bigger top serving area. But this left her no place for wine glasses. Elliot had told us she prefers the new style of stemless wine glasses; because they don’t break as easily. 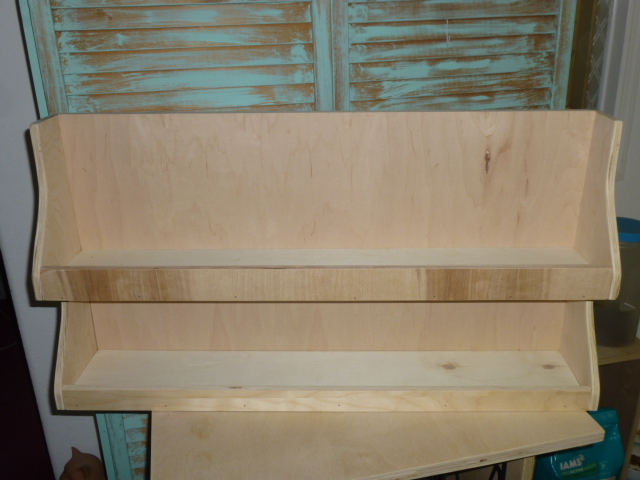 It’s a tad difficult to envision how this shelf works because it’s intended to be hung on the wall, above the rack, to hold glasses. I could only take a picture of it set on top of the rack though. The ledge across the front so the glasses can’t slip off was a great idea on Michael’s part. I had suggested just a big open box type of shadow box, that glasses could sit on the bottom and top of. Michael’s design idea is much more thought out. 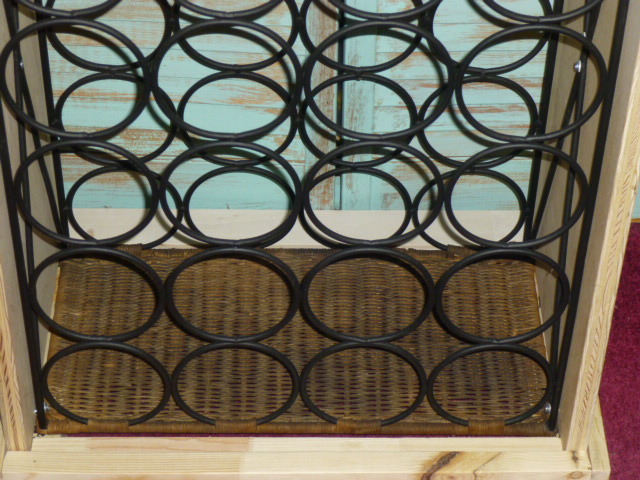 So, now she’s got her bar stools and wine rack and all set to be the party hostess!